A 55-foot fiberglass catamaran. A 350-square-mile marine park. Unlimited nitrox tanks to go scuba diving. Add five volcanic islands. 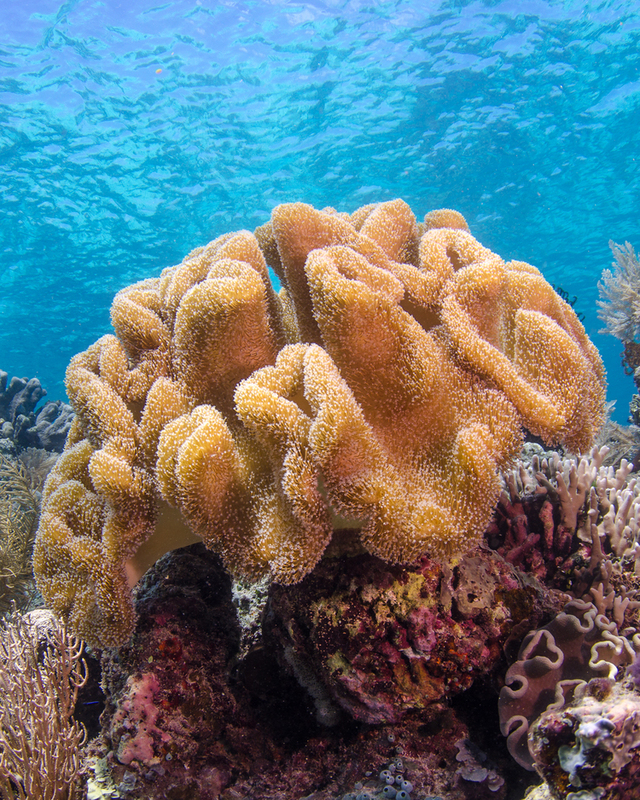 Include a fringing reef and a barrier reef. Throw in 390 species of colorful coral, hundreds of giant clams, and thousands of striped emperor angelfish. All that’s missing is a luxury resort. Oh, wait. That’s here, too. You’re in Bunaken National Park, one of the first marine parks that was established in Indonesia. It lies along the northeast coast of Sulawesi in the Greater Sunda Islands. These islands were formed by volcanoes millions of years ago and are now overgrown with sago palms and mangrove forests. They’re home to farmers who harvest bananas, sweet potatoes, and seaweed. Celebes crested macaques (monkeys) and Sulawesi bear cuscuses (marsupials) live here, too. Snorkelers, scuba divers, and photographers love the clear water and the pristine reefs. You’re excited about a new resort that opened last fall. 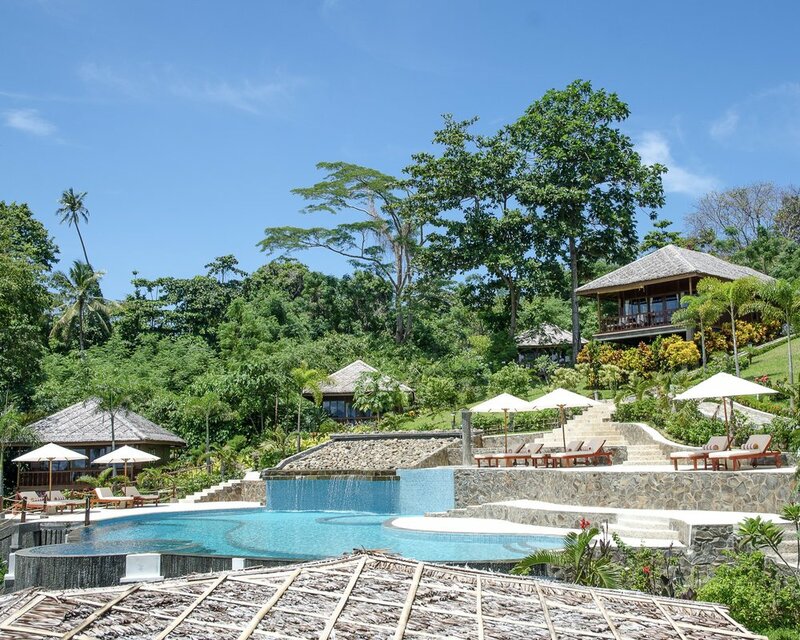 Bunaken Oasis Dive Resort & Spa was built into a steep hillside above Liang Beach on the island of Bunaken. A long jetty winds through the mangroves and up to the Long House. Meandering paths connect the cottages, the restaurant, and the spa. A free-form infinity pool sits in the center of the resort. While the Dive Centre, which includes a classroom and a camera room, seems to be the most popular spot on the property. You arrive on Bunaken after a flight from Singapore to Manado, a 40-minute drive to Manado Harbor, and a 30-minute boat ride from the main island. It’s a lot of travel time, but the resort perfectly planned your transfer in advance. You’re not surprised once you set foot on the island. The all-Indonesian staff is smiling and eagerly awaiting your arrival. They quickly learn how to pronounce your name. By the end of the day, you feel like extended family. Since all of the other guests are either diving or snorkeling right now, you have the resort to yourself. You settle into your traditional wooden cottage, which features a canopy king bed and a full-length balcony. You’ve been warned that the laundry basket in the bathroom steals dirty clothes; they’re returned neatly folded the next morning. After you unpack, you walk down to the pool and settle onto a sun lounger on one of the terraces. It’s quiet except for the sound of the waterfall and some birds chirping in the palms. A signature Bunaken Oasis cocktail appears as if on cue. Then one of the guys from the Dive Centre gives you options—a modern catamaran or a traditional wooden boat—for your first dive. Since each vessel takes a maximum of eight guests, you’re guaranteed personalized service and access to rarely visited parts of the reefs. Before he walks away, he excitedly tells you about the spotted seahorses that were, well, spotted this morning. But that’s tomorrow. For the rest of the afternoon, you’re going to relax by the empty pool, sip fruity cocktails, and watch the long-legged stork that’s walking through the garden. You’ll meet other guests and hear what they spotted today when canapés are served at the bar before dinner. You’ll eat fresh seafood in the dining room and watch a perfect sunset, since you’re on the western side of the island. Then you’ll have trouble falling asleep due to your excitement for the morning. But sleep seems to be the only thing missing in Bunaken National Park.